October is American Archives Month and National Family History Month. Two important topics in one month! In recognition, I wanted to share a little bit about how an archivist (me) thinks about storing family treasures. Most people have important items that document their family’s history. It might be photographs, diplomas, cookbooks, or a Bible. The items may have historical value or sentimental value. Whatever your treasured items are, there are some general tips for preservation. Store important items in a cool, dry area with a stable environment. This generally means no basements or attics. Fluctuation in temperatures and humidity can be very damaging. Store items away from water tanks, water pipes, humidifiers or anything else that introduce moisture to your historical materials. Similarly, store items away from a heater, fireplace, or furnace. This includes displaying items by hanging them on the wall. Don’t hang family photographs directly over a heating vent. Store items away from light. Sunlight and light bulbs can cause photographs and ink to fade over time. Before displaying items in your home, consider the amount of light they will be exposed to. Store paper documents and photographs unfolded and unrolled. Folds can weaken the paper and cause tears over time. Family treasurers are meant to be shared and enjoyed! When sharing those items with family during the holidays, use clean hands. Wash lotions off, and keep the items away from the dinner table or drink glasses. When handling photographs, wear cotton gloves to avoid leaving fingerprints and oils. 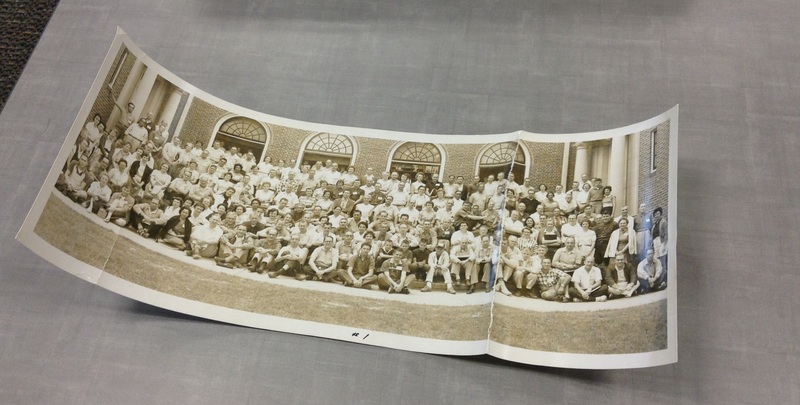 This oversize photograph at the CCHP was folded and rolled. You can see the damage it has caused. It is recommended to store items unfolded and unrolled. I’ve been working on unrolling this photograph by enclosing it an archival folder and placing heavy books on top. Over time, it will relax but will never go back to its original state. There are many resources available to provide more details about preservation. The Northeast Document Conservation Center (NEDCC) publishes a series of preservation leaflets. The Image Permanence Institute specializes in storage guides for photographs, including digital images. Additionally, many archivists order archival supplies, such as folders, boxes, and photograph sleeves, from Gaylord. 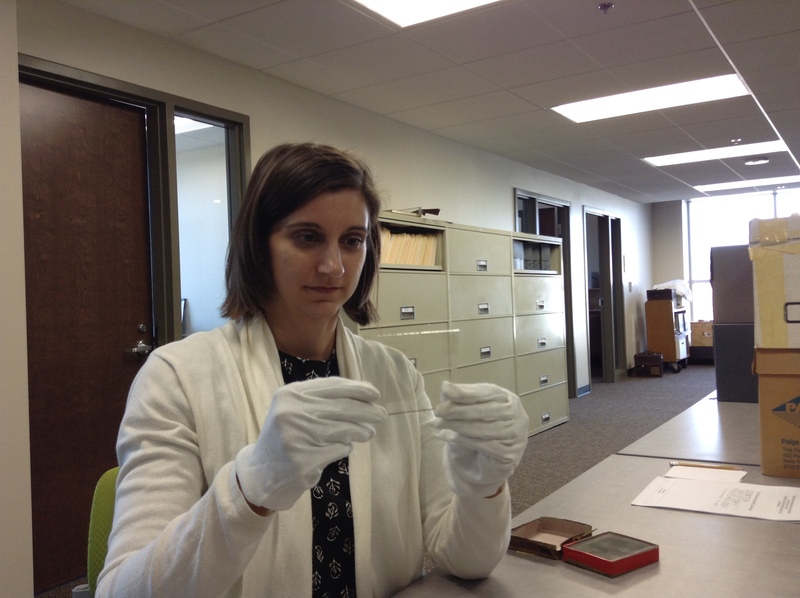 White cotton gloves are recommended for handling photographs, negatives, and glass plates. No fingerprints! I keep a pair of gloves in my desk drawer at all times. So this month, think like an archivist! Look at your family history treasures and consider what you can do to ensure their long-term preservation. – contributed by Amy Freels. Because genealogy and family history are popular topics, most people are aware of the need to digitize and label family photos. But did you realize that even if you do this, you could still be losing a part of your family story? In honor of National Organize Your Files Week, let’s talk about ways to organize your family photos to preserve family stories. What do you want your family to know or remember about you and your family? What is important to you that it not be forgotten? What doesn’t your family know that they should? What about your family history would surprise them? Start by organizing your photos. You’ll want to weed out the ones you know are extraneous, like duplicates and photos of nonfamily members. If working on all of your photos is overwhelming, pick a few favorites to focus on, keeping the above four points in mind. Group the photos by year or subject. If the photos are already in an album, don’t attempt to remove them—you could irreparably damage them. Next, label your photos. If you are working with originals, instead of photos that have been digitized, write lightly on the back with a pencil. Don’t push too hard. Be sure to include everyone in the photo, with full names and dates of birth and death, if known. Give the name of the photographer, the date the image was taken (estimates are okay), and the location pictured. Consider investing in a photo album that has space to record more detailed information. In the album, you’ll record the same information as above, so that you don’t inadvertently damage the photo by taking it in and out of the album. You’ll be able to include extra information in the album, like the relationship between the people pictured (cousins? siblings? ), what is happening in the photo and why, as well as the original owner of the photo or where it was found. Remember, don’t assume what is going on in the photo will be as obvious to future generations. Wedding photos from a century ago, for example, don’t look anything like what our wedding photos do today. You can do photo research to further the story for photos where you don’t know any information. If the name of the photographer is on the photo, this can help narrow down city and timeframe. Learning how to identify the type of photo can tell you a date range. Don’t forget to ask other family members for information. They may have further knowledge about the photos or may have photos to share that fill in gaps in your photo collection. If you are working with digitized photos, consider storing a digital file with the photos that includes all of the above information for each file. If you follow the above steps, you’ll not only have organized files, but will be well on your way to helping preserve your family stories. Amy Freels recently completed her certificate in Museums and Archives from The Institute for Human Science and Culture (IHSC) at The Cummings Center for the History of Psychology at The University of Akron.